Last summer I had the opportunity to make a flight above the city of lights, Paris, on board of a Aerospatial AS350 B2 "Ecureuil" of Aviaxess Company. This company and his fleet is based at Paris heliport, better known as Issy les Moulineaux airfield. The helicopter we have used for the flight the F-GYRJ. 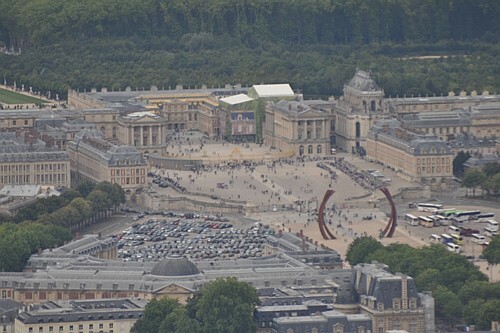 Sadly, the visibility was not optimal but sufficient to perform the flight and get the opportunity to see some well none monuments of the French capital. The Paris heliport is regrouping all helicopter companies and also the 'Securité Civile' helicopters held in stand by for all possible emergency purposes. The most impressive moments are off course the take off and the landing. The precision and the maniability of so kind of helicopter are really incredible. The adventure above Paris area took 60 minutes but due to the noise reduction law above the French city, the flight was split into 2 parts of 15 minutes. The break between the 2 periods was held at Saint-Cyr l'Ecole airfield, a place full of French aviation history. During the stop at Saint Cyr, I was talking with my pilot and he told me that he left few years ago a good job in an office and converts his passion of flight in a new career challenge. He explains us also the different laws that each helicopter pilot has to follow around Paris and you will certainly find this strange but the helicopter flights are observed by terrestrial police forces for speed and altitude...and it's very strict above Paris. Our route was passing above the Seine River than the famous Versailles castle which is very spectacular seen from high altitude. We had a great visibility on the Castle itself and the magnificent garden around. When we saw the amount of people visiting the place, we think we had a lot of chances to see it from the sky. The visibility on the Eiffel tower was great but for security matter there was no possibilities to come closer to this monument. Back to Issy les Moulineaux, this amazing experience was already over. I was also wondered when a saw a picture of the movie star John Travolta in the helicopter company building…in fact John Travolta, aviation minded guy, is one of the sponsor of the company! Originally, Issy-les-Moulineaux was simply called Issy. The name Issy comes from Medieval Latin Issiacum or Isciacum, meaning "estate of Isicius (or Iccius)", a Gallo-Roman landowner, although some think that the name comes from a Celtic radical meaning "under the wood". In 1893 Issy became officially Issy-les-Moulineaux. Les Moulineaux was the name of a hamlet, apparently named Les Moulineaux due to the windmills that stood in this area before. The town was the location of the Château d'Issy, home of the Princes of Conti. On January 1st, 1860 the city of Paris was enlarged by annexing neighbouring communes. Issy-les-Moulineaux was annexed to Paris, and was integrated in the 15th district of Paris. During the erection of the Eiffel Tower on the Champ de Mars in 1889, the French military based there were temporarily dislodged from their training ground for the period of the Universal Exhibition. They get than as compensation a vast terrain of 120 hectares in the countryside at Issy-les-Moulineaux. The Eiffel Tower was finally not dismantled after the exhibition and the military obtained definitively a part of the Issy les Moulineaux field. Later on the former military parade ground became an airfield. In 1905, the well-known Mister Ernest Archdeacon got the allowance to fly a Voisin biplane glider at this place. The experiment was held on March 26th and consists in the towing of the glider by a car with a sixty horses engine. The experience ends with the crash of the glider from an altitude of, however, hundred meters. On September 17th, 1907 Louis Bleriot cover a distance of 184 meters at 80 kilometers per hour with his two seat monoplane VI "Libelulle". In October, Henri Farman reached the distance of 771 meters. On January 13th, 1908, Henri Farman makes the first circuit of 1 kilometer in 1 minute and 28 seconds with a Voisin airplane equipped with an Antoinette engine and he wins the Deutsch-Archdeacon prize. To commemorate this historic event, in 1933, a monument sculpted by Paul Landowski was inaugurated at the entrance of this aeronautical place. In 1908, the military governor of Paris banned the use of airplanes due to many complaints received from the residents of Issy les Moulineaux. But this interdiction is lifted soon and in 1910, the first international race from Paris to Brussels in an airplane organised and the departure point is fixed at Issy les Moulineaux. April 12th, 1911 the French aviator Pierre Prier, director of the Bleriot Flying School in London, landed at Issy-les-Moulineaux coming directly from London Hendon Airfield. This flight is performed with a Bleriot monoplane aircraft type. The first flight between the two capitals took 3 hours and 56 minutes. On May 21th, 1911 is held the first Paris-Madrid race and was won by Jules Védrines But the race saw also the accidental death of Maurice Berteaux, Minister of War, hit by the propeller of Louis Émile Train airplane, attempting an emergency landing. Some years later the famous Paris Air International Aviation Exhibitions are held at Issy les Moulineaux. The company "Appareils d'Aviation des Freres Voisin" was the world's first commercial airplane factory created in 1908 which was initially located in Boulogne-Billancourt. And in 1920 most of Voisin's manufacturing facilities were relocated in neighboring Issy-les-Moulineaux. "Avions Voisin" company closed its doors in 1940. In 1922, Raoul Pateras Pescara was testing the first French helicopter there. He was the conceptor of the cyclic control and thanks to his invention he could make an amazing flight of 736 meters. In 1940, the airfield suffered the bombing of the Luftwaffe and was quickly under the control of the Germans. After the war, the buildings are becoming more prevalent around the airfield, which imposes many restrictions. As the tracks are now too short for modern aircraft. The fast development of helicopters makes that several helicopter companies installed themselves on the airfield. In 1952 is held the first International Helicopter Cup and the winner of this first edition where John Henry Monk and Gerard Henry. In 1953, the planes disappear definitively from the airfield. In 1956, the airfield is set under the authority of Aéroports de Paris and became the official Paris heliport. In March 1957, Sabena opens, during the Universal Exhibition of Brussels, a passenger line between Paris and the Belgian capital. The two cities are connected in1 hour 15 minutes and the helicopter line continues until 1962. The line was finally stopped because a lack of profitability reasons. 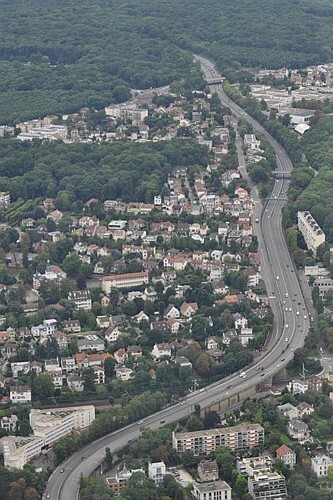 The field is gradually reduced for different reasons: in 1958 to build the motor ring of Paris and for sport fields. Later on for the construction of EDF (Electricité de France) tower, Sofitel hotel and famous "Aquaboulevard". The heliport saw its frequentation decreasing every year because of competition from other fields such as Le Bourget airport, and growing problems of noise pollution in an area more and more peopled. By 2014, the reduction of movements is estimated from 12 000 currently to 3000 per year. A third of the flights are for private travellers, especially businessmen or "VIP". This decision was taken following lengthy negotiations between the city of Paris and the Ministry of Transport to reduce the traffic from the heliport, which causes more and more noise nuisance for local residents. Only emergency missions and those so-called "public service" will be retained. The decision of the state is also related to the location, close to the heliport, if the future headquarters of the Ministry of Defence in 2014. However, the state is studying the implementation of new heliports, one on the east side of Bercy (12th district), and one to the north, near the Porte d'Aubervilliers (18th and 19th district). There are also plans to create a heliport to the business district of "la Défense" and a last one in the Seine-Nord, in the area of Gennevilliers and Villeneuve-la-Garenne. It is also planned to develop traffic at Le Bourget airport. These settlements have been no consultation as Denis Baupin, deputy mayor of Paris in charge of sustainable development, which denounces these projects in total contradiction with the plan against noise being developed. 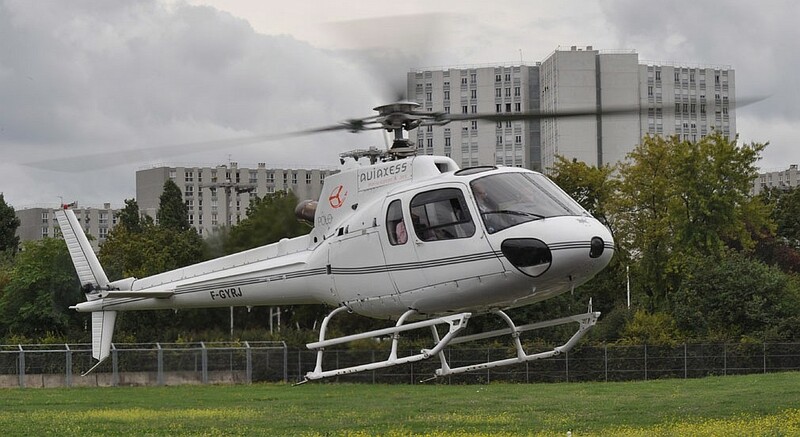 Other Paris heliport based companies with Eurocopter helicopter... ...or Aerospatial "Dauphin"
The airfield of Saint-Cyr-Ile l'École is located 21 kilometers southwest of Paris, in the Yvelines department. The airfield is also operated by Aeroports de Paris. The aeronautics industry of Saint-Cyr-l'École dates from the early twentieth century. The Count de la Vaulx built in 1907 at "the gates of Saint-Cyr" a hangar for a dirigible airship called "Aeronat". That same year, Santos-Dumont continued testing his monoplane called "La Demoiselle" between Saint-Cyr and the city of Buc Three years later, in 1910 the airship "Liberty" made a series of ascents. Te first rigid airship the "Spiess" was also built at Saint Cyr l'Ecole by Zodiac Company in 1913. In 1911 the institute of aerotechnics and technologies (IAT) is created at Saint Cyr l'Ecole by Deutsch de la Meurthe to perform "all research and testing on the technical equipment in balance or in movement in the air." Research undertaken in 1909 by Gustave Eiffel. In 1911 Gustave Eiffel creates a diffuser designed to increase the energy efficiency to create an artificial air currents, in one word a wind tunnel. In September 1912, Captain Etévé is promoted chief of aerospace center of Saint-Cyr-l'École, aviation and ballooning are grouped under his authority. The airfield is growing and became the military base 272. In 1913, the first group of ballooning is based at Saint Cyr l'Ecole. And they perform many airship test, the well named "sausages" are mounted in the base workshops where many women of the neighbouring village are employed for the fabrication. In August 1914, at the beginning of World War I, Camp Mourmelon moved to Saint-Cyr l'Ecole, and during the war, the airfield became a huge workshop and repair facility point for damaged equipment arriving by train from the front. Four thousand people, civilian and military work there in 1917. In 1944, during the Second World War, allied bombers destroyed the military installations and the city occupied by the German forces As from 1946, the base is closed and the airfield is transferred to the Ministry of Public Works and Transport and is now managed byAéroprts de Paris. Today, 12 flying clubs and a helicopter training school are based at Saint Cyr l'Ecole and the airfield record more than 70.000 movements each year.